By the editors of Ministry. 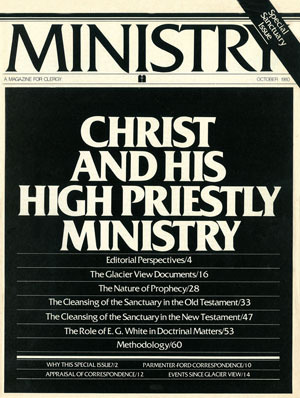 This double-size issue of MINISTRY seeks to take you into the recent conferences between Dr. Desmond Ford and representatives chosen by the church. At issue over the past ten months have been positions attributed to Dr. Ford on Daniel 8:14, the day of atonement, and the investigative judgment. What are Dr. Ford's views? How has the church related to them and, of equal importance, we believe, dealt with Dr. Ford? We recognize that some readers may feel the contents of this special MINISTRY will only add fuel to the controversy and thus accelerate divisiveness. We have concluded, however, that someone must address the tapes, articles, brochures, magazines, and other media that are raising questions and, in some instances, doubts concerning both Dr. Ford's views and the church's response to them. At the least we hope to lay to rest a substantial number of rumors, falsehoods, and exaggerated reports in circulation; and we would be happy if our candid and reasonably complete digest of the facts should prove helpful and unifying. The preponderance of materials circulating on these issues seems to support views and concepts quite different from our established position. MINISTRY has purposely refrained from printing its perspective until after the final meeting at Glacier View Camp, Colorado, on August 15. It is our earnest hope that the Biblical answers supporting our doctrinal position will be useful to every reader. In this age of intellectual inquiry, when almost any thesis can gain an attentive hearing in the church in the spirit of "open investigation" and "academic freedom," it seems somewhat ironic that attempts by the church to respond to positions that seem to undermine its position are so often characterized as reactionary. In view of this, we have tried to present our material in the most objective way possible. Yet we are the first to admit that total objectivity is an unobtainable goal. Whether ignorant or learned, finite man is biased. As long as we "see through a glass, darkly," man will ever have the problem of being absolutely accurate. Let it be clearly understood that what we have printed in the question-and-answer section is not to be taken as the official view of the church on the sanctuary doctrine. We have only one official view, the Statement of Fundamental Beliefs voted at our April, 1980, General Conference session. Even "Christ in the Heavenly Sanctuary," adopted at the Glacier View meeting, is not the official view of the church other than that portion taken from our Fundamental Beliefs. It is our conviction that regardless of how or by whom this topic has come under such wide discussion, it has all been in the providence of God. If for no other reason, all the time, energy, and money expended during the past few months has been worth it if it will renew our interests and belief in the grand doctrines that impelled our pioneers to go forth to the world with the urgent cry "Behold, the bridegroom cometh." If we as ministers are led to a more diligent study and a more dynamic preaching of Christ's ministry in the heavenly sanctuary, perhaps it will has ten the return of our great High Priest, Jesus Christ, the Son of God.